​The West Wight is the least populated and (arguably) the most beautiful part of the Isle of Wight - although many south Islanders will disagree... Parts of it are quieter than a trainload of sleeping mime artists and the nightlife is limited to say the least. However, that doesn't mean there isn't anything to do. West Wight beaches are mostly lacking in facilities and seaside amusements but are quieter than resorts like Sandown, Shanklin and Ryde. There aren't many hotels right on the beach, or esplanades to wander along. About half of my childhood was spent at Hanover Point and the adjacent beach at Compton Bay, which gets good surf on the right day. As you head further towards the Island's southerly point (Whale Chine area) it gets more and more remote and the beaches became harder to access without abseiling or walking along from another beach. Freshwater Bay is pretty and much easier to access (you could take a wheelchair onto the top bit). It is used frequently by Isle of Wight Adventure Activities because of its caves which are good for kayaking and coasteering. Colwell Bay has a sandy beach, though not a huge amount of space for ball games. Totland Bay has a lovely outlook but is a bit stoney. See our lovely clickable beaches map. If you've arrived to find it is minus three and the forecast is for rain all week, you might consider West Wight Swimming Pool which is in Freshwater. Opinion was always divided in our family about Alum Bay and The Needles. The coastline and bay are undoubtedly dramatic, and there are really lovely views from Headon Warren when the purple heather is out. My father was amongst those who are horrified at all the clanging amusement arcades, glass blowing, funfair rides and the like. 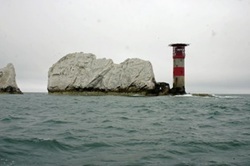 The Needles Lighthouse is closed to visitors, but you can take a boat out to it. ​Personally, I love the view from the chairlift and have started to enjoy the attractions and the boat trip. There's also a bit about the odd history of the Needles, which includes space rocket testing and wartime defence. At the headland you'll find The Needles Old Battery, which is a National Trust property. You can go through a tunnel to get a great view of The Needles and sit in their rather quaint cafe. 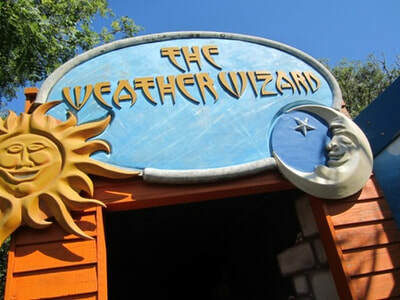 ​You pay a bit to park (£5 last time I went) and then just pay for each attraction. 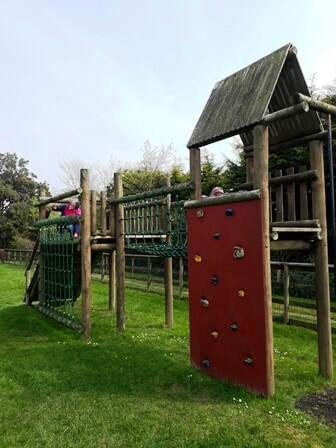 Tapnell Farm Park is great for families with a children's adventure play barn, pedal go karts, bouncing pillow, soft play area, petting zoo, wallabies, meerkats and some other animals. 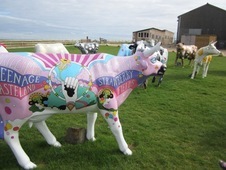 There are also some full size plastic cows which have been decorated by various local businesses and organisations. It also has a nice cafe and restaurant with good views of the site of the famous 1970 Isle of Wight Pop Festival which was attended by every hippy and his dog. ​St Peter and St Paul Mottistone is the one where Benedict Cumberbatch married Sophie Hunter in 2015. St. Peter's Church in Shorwell features a 15th century painting of St Christopher. Don't plan a whole day shopping in Yarmouth, it really is a very small town. Visitors can be found wandering around looking for the town centre, not realising they are standing in it. It is though a really pretty little place with several places to eat. 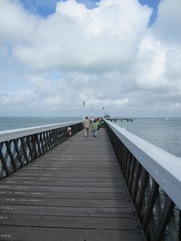 It has a pier which you can walk up, although there's not a lot to do on it. Freshwater has a few more shops - not exactly a heaving metropolis but somewhere to buy a sandwich at least. You can of course walk along the coastal path at any point on the Isle of Wight, but the stretch around the West Wight is probably the nicest bit. Some parts around the north east coast (between Ryde and East Cowes) spend quite a lot of time inland because of accessibility issues, but the West Wight stretch is much more open. Alternatively, there's a short section of former railway line which has been turned into a cycle track in Yarmouth (see the Red Squirrel Trail Website for details of the route). It's alongside a bike hire place called Wight Cycle Hire and there's a cafe en route if you decide you'd rather spend the day sipping a latte. More adventurous cyclists can tackle the West Wight section of the Round The Island route. This rather good video shows a few sections of the West Wight coastline. There aren't really a great deal of people in some parts of the West Wight, as it is pretty much all an 'area of outstanding natural beauty'. As a result, there is not much light pollution so you can actually see the night sky. 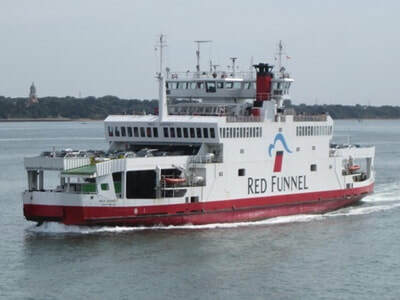 There is a good guide to stargazing locations on Red Funnel's website which recommends sites including Atherfield, Compton, Newchurch, The Needles and St Catherine's Down. The map shows one stargazing spot, near Atherfield in the West Wight. Back in the day, sleepy Freshwater was a meeting point for various artsy bigwigs. Julia Margaret Cameron was herself a photographic pioneer and based herself at Dimbola Lodge. Nowadays, papparazzi would be flogging photos to Heat Magazine of visitors coming to the house, including Alfred Lord Tennyson (the Poet Laureate who wrote "Charge of the Light Brigade") and GF Watts (no, me neither, but apparently he was a famous sculptor and painter). You can see Julia Margaret Cameron's work at Dimbola Lodge, and a statue of Jimi Hendrix, who played at the nearby 1970 Isle of Wight Pop Festival. One of the Isle of Wight's weirder historic attractions is the Longstone, which are two big lumps of stone which sit in a field in the middle of nowhere. There are various odd stories online about rituals and the like, which are most likely nonsense, but they do make guided tours a bit more juicy. 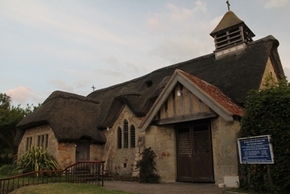 You can read more about their history in our guide to 25 historic attractions on the Isle of Wight. The nearest postcode is PO30 4EA (see map below). 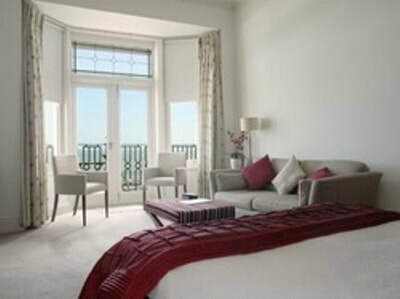 Isle of Wight Pearl ﻿seems to have a constant stream of coach parties who tuck into cream teas whilst admiring the impressive view before stocking up on this year's must-have pearl. It is free and it is in a really lovely location, right on the edge of the cliff (there are even signs telling you not to walk off the cliff). If pearls aren't your thing, the car park next door leads down to a very quiet little stretch of beach called Chilton Chine which I'm rather fond of. What's the opposite of 'whiteknuckle' thrills? Normal coloured knuckles? Anyway, whatever it is, you can find it at Calbourne Mill which is a serene/sleepy day out. There's a working water mill, a 'clay play' area, a small war museum (i.e. a small museum about wars, rather than a museum about small wars), mini golf, 'rural museums' (which sounds a bit like the bottom of my grandad's garden), punts, croquet, petanque, lego tables and a giant chalkboard. You have to pay extra for some things once you get inside. Another Isle of Wight venue for a quiet day out is Chessell Pottery Cafe, which was previously called Chessell Pottery Barns. As well as eating cream teas you can also do some pottery painting so it's perhaps one for a rainy day? Read about our unicorn-themed day out at Chessell Pottery (unless there's something good on telly of course, in which case I wouldn't bother). The West Wight is not the Isle of Wight’s best spot for a rainy day, unless you are one of those hardy ramblers who loves the feeling of water dripping off your nose whilst your cold knuckles clutch a transparent map holder. Normal people might consider a tour of the West Wight’s finest car parks. 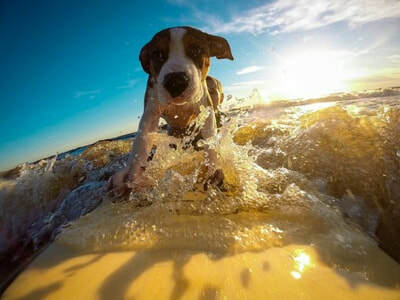 It might sound as much fun as a punch in the face but it is actually a pleasant experience, compared to sitting in your holiday home and playing Uno all day. You can find out more about locations in our guide to Isle of Wight car park viewpoints. 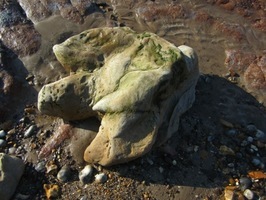 I once spent an entertaining hour trying to find the dinosaur footprints which are allegedly visible at Brook Chine. After much searching and a strange conversation with a local enthusiast I returned home to be told by my mother that I had just been looking at a foot shaped rock. Nonetheless, the West Wight is prime fossil finding territory with the area around Yaverland near Sandown also a popular spot. There are organised fossil tours led by people such as Dinosaur Expeditions and Dinosaur Isle who hopefully know the difference between a stone and a priceless fossil. Read the blog about our feeble fossil hunting expedition. Towards Yarmouth you'll find Fort Victoria Country Park, with its quirky little collection of mini attractions. There's a planetarium for stargazers, a reptilarium for animal lovers, a model train for railgazers and the sunken secrets museum for, er, underwater archaeology gazers? Unfortunately the small aquarium at Fort Victoria closed at the end of the 2015 season. 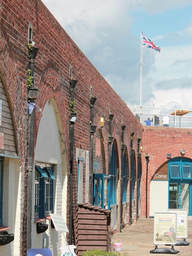 It costs about £4 - £5 for individual attractions at Fort Victoria. Opening an Alpaca Farm on the Isle of Wight may sound like a premise for a Brit-com starring Rosamund Pike and David Tennant (with a small comedy role for Maggie Smith) but it is a real thing. You can take an Alpaca for a walk from £14, eat in the cafe and then buy a pair of deluxe Alpaca socks if you fancy it. Entrance to the farm is £7.50 for adults (2018 prices). "Why does everyone keep looking at us?" 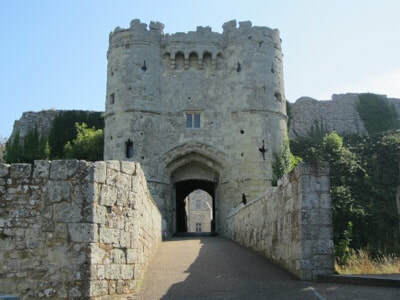 One way to explore the West Wight is to do an organised treasure hunt. At the time of writing, there are three on offer from Treasure Trails covering Yarmouth, Freshwater Bay and The Needles. Brighstone's playground isn't particularly new, large or flashy (I'm selling it well, aren't I?) but it is in a pretty location alongside a stream. We wasted a happy hour playing Pooh Sticks and messing around on the playground which was quiet despite it being a sunny day during the school holidays. Park on the street at PO30 4BD. Freshwater's playground is larger though it's not in such a pretty spot. 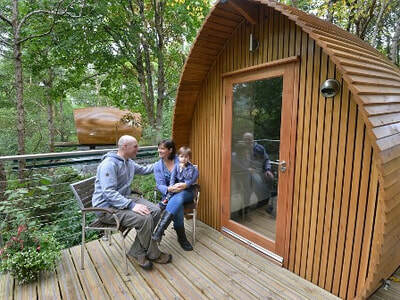 Again, it isn't the most modern but it does have stuff for toddlers and primary school aged children, as well as an outdoor gym so you can work on your six-pack for the beach. Park on the main road at PO40 9AX. 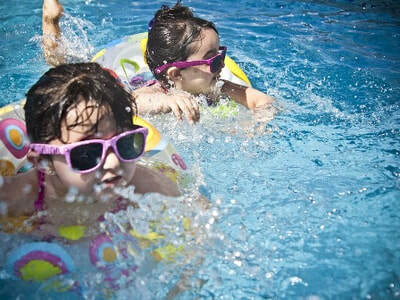 See our toddlers guide for more on playgrounds.